Robert the Bruce, the greatest of Scotland's Kings, died on 7th June, 1329 at the manor of Cardross, Dunbartonshire and was interred at Dunfermline Abbey. After suffering a stroke and on his deathbed, the great fourteenth century warrior king knew he would be unable to fulfill his solemn vow to go on pilgrimage to the Holy Land. He asked his life-long friend, Sir James Douglas, known by the English as Black Douglas, to carry his heart there instead. In the year following Robert the Bruce's death, the faithful James Douglas set out for the Holy Land in fulfillment of his oath to the dying King, taking his heart with him in a silver casket. With the heart of the Bruce contained close to his own, the faithful Douglas set out on his crusade, joining with King Alfonso XI of Castile at Grenada where he was laying siege to the Moorish castle of Teba. Douglas, in the thick of the fighting and deserted by his Spanish allies, threw the heart of the Bruce deep into the melee, biding it "Go first as thou hast always done." Douglas himself was killed in the ensuing fighting and his body was returned to his native Scotland. The casket containing the heart of the Bruce and Douglas' body were carried back to Scotland by Sir William Keith of Galston, where it was finally laid to rest at the Abbey of Melrose, which event was recorded for posterity by the Scottish chronicler John Barbour's epic fourteenth century poem 'The Bruce'. Robert the Bruce held great affection for Melrose Abbey and had left instructions that his heart was to be interred there, while his body was to be buried at Dunfermline Abbey, the traditional last resting place of Scottish kings. Douglas body was interred at St Bride's chapel, at Douglas, Lanarkshire. Thereafter the Douglas coat of arms displayed a crowned heart in remembrance. Most of Robert's tomb was destroyed during the Scottish Reformation, but on 17th February 1818, workmen employed to build a new parish church on the site of the eastern choir of Dunfermline Abbey discovered a tomb before the site of the high altar of the former abbey. The tomb was covered by two large stones, a headstone and a larger stone measuring around six feet (182 cm) in length. On removing the stones, they uncovered the remains of an oak coffin containing a skeleton enclosed in two layers of lead, covered by a shroud of cloth of gold. The sternum (breastbone) of the skeleton had been split open and the skull wore a lead crown. In the debris around the grave, fragments of black and white marble were found, which were linked to Robert the Bruce's recorded purchase of a marble sarcophagus. 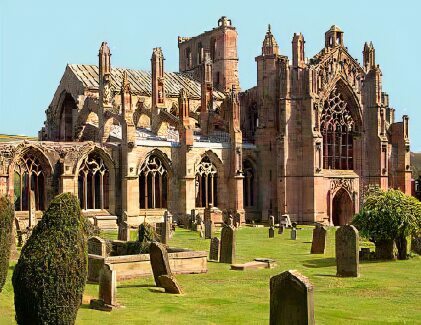 In the summer of 1996, archeological excavations by a team from Historic Scotland, were undertaken on the floor of the Chapter House at Melrose Abbey, aimed at discovering more information about the building. They investigated a lead container reputed to contain the mummified heart of King Robert the Bruce, which had been uneathed under the floor. A small hole was drilled into the casket and the contents examined with a fibre-optic cable. A further casket was discovered inside. The larger casket was then opened and revealed to contain a small conical lead container which bore an engraved copper plaque stating 'The enclosed leaden casket containing a heart was found beneath Chapter House floor, March 1921, by His Majesty's Office of Works'. Richard Welander, one of the investigators, concluded that although it was not possible to prove with certainty that the contents of the casket were the remains of the Bruce's heart, he stated that "We can say that it is reasonable to assume that it is". No records exist of anyother heart being buried at Melrose Abbey. Donald Dewar, Secretary of State for Scotland commented "There is a strong and proper presumption that this is the heart, but in a sense it does not matter. The casket and the heart are symbols of the man." The casket which contained the heart was left closed, and kept in safekeeping in Edinburgh until its reburial in a private ceremony at Melrose Abbey which took place on 22 June 1998. On the 24th June, on the anniversary of Bruce's famous victory at Bannockburn in 1314, to the strains of bagpipes and medieval poetry in praise of freedom. 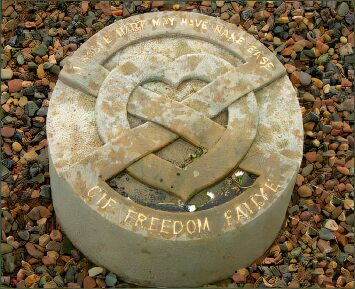 Donald Dewar unveiled a sandstone marker over the site in the abbey grounds where the heart is now interred. Dewar described the ceremony as "one of great significance and symbolism for the people of Scotland".